Just regular folks. 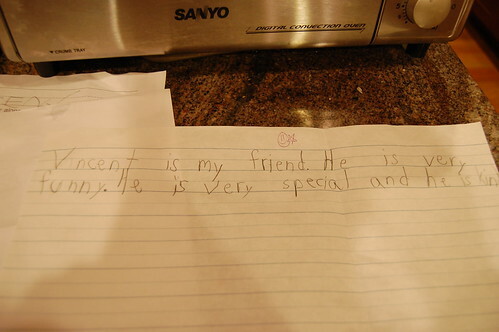 : A note from S.
I found this in Vince's backpack a few days ago. Vincent is my friend. He is very funny. He is very special and he is kind. The other day, Vincent and I went to Safeway to buy his lunch favorates to carry to his school. After he got what he wanted, he spotted a big jar full of Cheese Balls. He asked me whether we could get this one for Edda - his sister who never be able to clearly asked for anything. I could tell from his eyes and expressions on his face that he really meant it. I asked him how he knew Edda liked them. He told me he watched Edda ate a lot of those balls in a party. Of course, she liked them. And, he is very special and very nice.